Coalition plans to hold industry accountable to communities of color. From left: Alex Nogales of NHMC, Daniel Mayeda of APAMC, Guy Aoki of MANAA, Sonny Skyhawk of AIFT. Members of the Multi-Ethnic Media Coalition, which has met annually with the top four television networks (ABC, CBS, NBC and Fox) since 2000, have announced a new initiative to meet with the top six motion picture studios — Sony, Warner Bros., Fox, Universal, Paramount and Disney. The coalition includes the National Hispanic Media Coalition (NHMC), Asian Pacific American Media Coalition (APAMC), and American Indians in Film and Television (AIFT). • Create whatever pipeline programs are necessary to ensure that people of color have genuine opportunities to participate in all aspects of the creation of American motion pictures. As it has in the past issued annual report cards grading the networks on their diversity and inclusion efforts and results, the coalition intends to do the same with the major motion picture studios. “All of our organizations have worked together since the summer of 1999 to improve opportunities for people of color in television,” said Sonny Skyhawk, a member of the Academy of Motion Pictures Arts and Sciences and founder of AIFT. “We’ve met with the top four networks since 2000. Each year, they’ve provided data on the minorities they’ve hired as writers, producers, directors, and actors, and we’ve discussed how accurately their series are reflecting reality. “The fact that all of the nominees across the top four acting categories at this year’s Oscars are once again white impacts African Americans, Latinos, Asian Americans, and Native Americans,” said Alex Nogales, president and CEO of NHMC. “Individuals from all of our communities have been denied meaningful opportunities for their work to be considered for Academy Awards. “The academy can only vote on works that the movie studios decide to make,” said Daniel Mayeda, co-chair of APAMC. “Most of the people who have the power to greenlight films are white. And despite data that proves otherwise, they insist that projects which feature minority casts won’t do well at the box office. In 2015, the Multi-Ethnic Media Coalition also met with talent agencies CAA, William Morris Endeavor, ICM Partners, and Paradigm, urging them to hire more people of color as agents and to diversify their client lists. The Multi-Ethnic Media Coalition was formed in 1999 after Greg Braxton of The Los Angeles Times wrote an article revealing that, of the 26 new shows debuting in the fall on ABC, CBS, NBC, and Fox, not one had a person of color in a primary or secondary role. 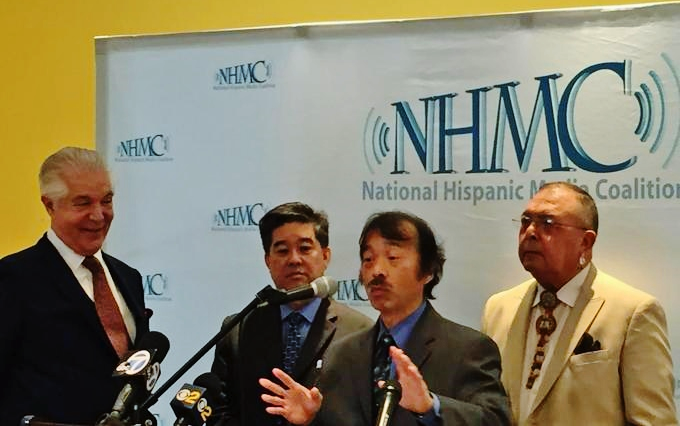 NHMC is a media advocacy and civil rights organization for the advancement of Latinos, working towards a media that is fair and inclusive of Latinos, and towards universal, affordable, and open access to communications. AIFT is an advocacy group that endeavors to defend and enhance the interests of American Indians in the mediums of film, television and telecommunications. APAMC advocates for the visibility and inclusion of Asian Americans and Pacific Islanders in the entertainment and media industries. Coalition members are Asian Americans Advancing Justice | AAJC, East West Players, Japanese American Citizens League (JACL), Media Action Network for Asian Americans (MANAA), National Federation of Filipino American Associations, OCA-Asian Pacific American Advocates, Sikh American Legal Defense and Education Fund, and Visual Communications. Clearly, changes in the makeup of the voting members of the Academy address only part of the problem. As Viola Davis said in accepting an Emmy Award last year, you cannot win an award for a role that is not there. So we seek to tackle the production side of the problem. And ask, why are there so few good roles in American films for actors of color? First, actors of color are too often deprived of roles that are written as ethnically specific, or that are based on real POC. E.g., Jennifer Connelly won an Academy Award in “A Beautiful Mind” for her portrayal of a woman from El Salvador. That was, by definition, an Oscar-worthy role — it should have gone to a Latina actress. Ben Affleck directed the Academy Award-winning movie “Argo.” He could have and should have cast a Latino for the lead role of Tony Mendez. Instead, he took that part himself. Unfortunately, these are not isolated instances. It is a fact that twice as many white actresses have won Oscars playing Asian characters as Asian American actresses have won playing Asian characters. This whitewashing must stop! Second, as television has demonstrated the past two years, audiences are hungry for new stories that reflect all Americans. We urge the film studios to open their eyes and their minds to the many glorious stories and actors coming out of communities of color. In the past, Hollywood has only made pictures starring actors of color who were the most extraordinary persons of their race, such as MLK or Jackie Robinson or Gandhi, or perhaps an especially dignified slave or maid. In contrast, the studios will greenlight a picture about a white family emigrating to Brooklyn, or a white lady who invented a mop. Give the white audiences a little more credit. They’ll go see movies that star people of color if the stories are compelling. This past year, “Furious 7,” “Straight Outta Compton,” “Creed” and “Star Wars” prove it. And, by featuring actors of color, that will dramatically increase the films’ chances of attracting new, diverse audiences. In 2014, according to the MPAA, people of color bought 46 percent of all movie tickets in the U.S. And, “Furious 7” shows that multicultural casting can also lead to huge box office grosses overseas. The bottom line: we’re not asking for charity. We’re saying that the film studios need to catch up to the new global realities. America is changing. Its diverse audiences yearn to see movies that reflect themselves and the changing world around them. So, how about it, Hollywood? Why not try to appeal to new audiences by including new talent? It will be a win-win for all: More money for the studios. More opportunities for actors of color. And eventually the Oscars can truly represent the best of all of America. Even when the powers that be agree to produce films about Asian Americans, they often cast white or non-Asian actors in their place! In 2008, Sony Pictures released “21,” based on a novel where an MIT math professor taught his students how to win at blackjack in Las Vegas. That professor, most of those students, and the one who won the most money were Asian Americans. In the movie, the main characters were played by Kevin Spacey and a British actor who needed an accent coach on the set so he could learn how to sound like an American! In 2010, M. Night Shyamalan adapted the popular Saturday morning cartoon show “Avatar: The Last Airbender,” which was populated solely by Asian and Inuit characters. In his film version, all the good guys were white and all the bad guys Asian or brown-skinned. Last year, MANAA raised concerns about two white-washed movies which got a lot of press attention: In his film “Aloha,” director Cameron Crowe cast over 30 white actors, and the only real speaking part for anyone Asian or Pacific Islander was contained in a seven-minute scene where a Hawaiian activist played himself! And don’t get me started on Emma Stone! In the book version of “The Martian,” Mindy Park — the NASA worker who realizes Mark Watney is still alive on Mars — is Korean American. She calls her supervisor, Vankat Kapoor — Asian Indian — and together, they work with NASA to plan a rescue mission. Kapoor also strategizes with the head of JPL, Bruce Ng, a Chinese American. But in Ridley Scott’s film, Mindy Park is white, Vankat Kapoor becomes Vincent Kapoor — played by a black actor — and luckily, Bruce Ng is still Chinese. But had the director stuck with the original ethnicities in the book, you would’ve had THREE Asian Americans working toward the rescue of Matt Damon in this feel-good, critically acclaimed movie. A huge missed opportunity. In the upcoming “Ghost in the Shell,” Major Motoko Kusanagi will be played by… Scarlet Johansson. In “Dr. Strange,” the Ancient One — an old Tibetan man who teaches the future superhero how to develop his mystical powers — will be portrayed by Tilda Swinton. In 2001, when the top four TV networks began giving us data on the people of color they’d hired, there were only 17 Asian Pacific American series regulars between them. Change came through pipeline programs such as showcases for diverse talent and years of pressuring the networks to include more Asian Americans whenever possible in significant, stereotype-busting roles. For this current season, the number of Asian Pacific American regulars on the networks jumped to 41! And there are seven series on network, cable and streaming platforms that actually star APAs — first name in the credits! That includes ABC’s “Fresh Off the Boat” — the first Asian American family sitcom in 20½ years. Just as we’ve made a profound difference behind the scenes improving diversity on television, we now set our sights on getting the movie studios to do the same on the big screen. Can someone tell me why there are no African American organizations represented in this “coalition”? NAACP is an integral part of the multi-ethnic coalition. They could not be present for this February 4 press conference because they had a big symposium at the Museum of Tolerance on February 3, part of their Image Awards event on February 4 and their televised, live Image Awards gala on February 5.